“Such a redirection of resource usage could create new economic opportunities in the fisheries industry and go some way to addressing malnutrition of the rural poor,” says Kerri Brick, researcher at the Environment for Development initiative (EfD) in South Africa, hosted by Environmental Policy Research Unit (EPRU) at University of Cape Town. The study is an interaction between the local fishing industry, a scientific monitoring group called CapFish, Marine and Coastal Management, and EfD/EPRU. ”As Dr Leiman was actively sought out by Marine and Costal Management for participation, EfD/EPRU is providing demand-driven research as opposed to just supply-driven. It was important for us to show that we can respond to policy makers’ research needs. Working with Marine and Costal Management on this inter-disciplinary project also increases our visibility to people working in different parts of the field, and helps build networks,” says Brick. CapFish is responsible for the scientific component while the environmental economists from EfD are adding the economic dimensions. For example, EfD researchers provide an analysis of anchovy products traded globally and imported into South Africa. Assessments of which anchovy products could be developed for the South African market and of the implications of expanding the anchovy industry for employment are also considered. “Given the abundance of the resource, the South African Department of Environmental Affairs has noted that anchovy landings could potentially be doubled while still maintaining a sustainable fishery,” says Brick (left). Since the 1970s, South Africa’s average annual anchovy landings have exceeded 300,000 metric tons. The Department of Environmental Affairs' vision is that a significant portion (at least 10 percent) of the anchovy resource be used for human consumption. Several countries use anchovy for human consumption. Peru, for example, has turned a portion of its, until now, exclusively fishmeal-directed anchovy production into a high-protein food resource. Within three years, the human consumption of anchovy and anchovy products has increased to 100,000 metric tons annually. 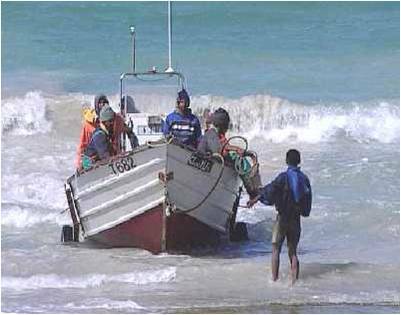 Though, Peru has a significantly larger anchovy fishery than South Africa. Additionally, the size of the local fish is far smaller in South Africa. Smaller fish means higher labor costs, since each fish must be cleaned and prepared individually and manually. The investigation by EfD and CapFish found that in the past, several initiatives to divert the use of the anchovy catch had been undertaken in South Africa by local pelagic fishing companies aiming to utilize a portion of the anchovy catch for direct human consumption. Their products included cured anchovy, canned anchovy fillets with capers, anchovy paste and dried anchovies, and were sold on the local and export markets. So why did the South African production of anchovy for human consumption cease? A decrease in the average size of the anchovies starting in the 1980s, and the manual labor required to prepare each fish individually are cited as the main reasons, and quality problems blamed on high lipid content, oxidation and rancidity have contributed as well. While the recorded size of the anchovies caught ranged from 12 to 15 cm in the 1980s, analyses of the average length of anchovy catches since 2001 indicate that the average size has decreased to less than 8 cm. Though, larger anchovies are caught seasonally, south of 33o S and on the Agulhas bank. With a view to utilize anchovy for direct human consumption, the pelagic industry has investigated the possibility of targeting larger anchovies off the Agulhas bank. However, the attempts to use deeper purse-seine nets in these areas have been unsuccessful and found to be extremely dangerous due to the strength of the Agulhas current. “Our recommendation is that the industry investigates the feasibility of targeting shoals of larger anchovies, and sets up onboard facilities to preserve the fish in chilled or refrigerated seawater,” says Brick. Furthermore, EfD/EPRU and CapFish note in their research report that the robustness of larger fish (of 10 cm plus, preferably larger than 12 cm) facilitates more efficient and effective de-heading and cleaning, which is an essential prerequisite in the processing chain to utilize anchovy for direct human consumption. In the South African context, the manual labour requirements could provide significant work opportunities for semi and unskilled labour. The manual labour required has the potential to create employment in the impoverished coastal rural communities. Making use of this opportunity, along with the opportunities for small and medium enterprises (SMEs) to utilize South African anchovies instead of imported products and set the platform for the development of new SMEs. The report is currently being reviewed by Marine and Coastal Management.